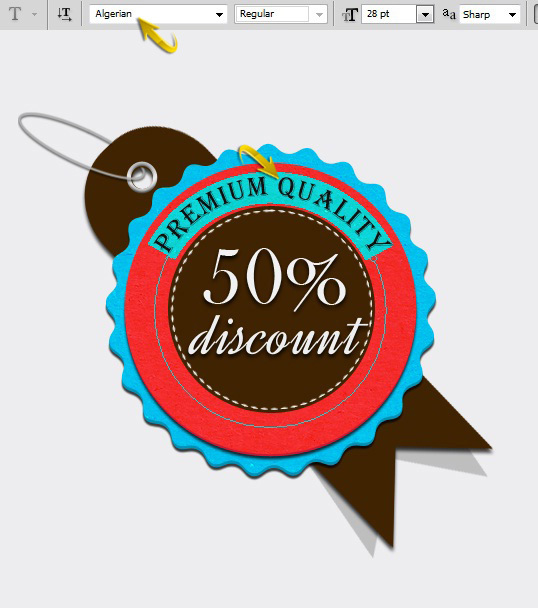 Badges are a great way to display information on any blog or website. Due to their eye-catching quality, they grasp the visitor’s attention instantaneously. 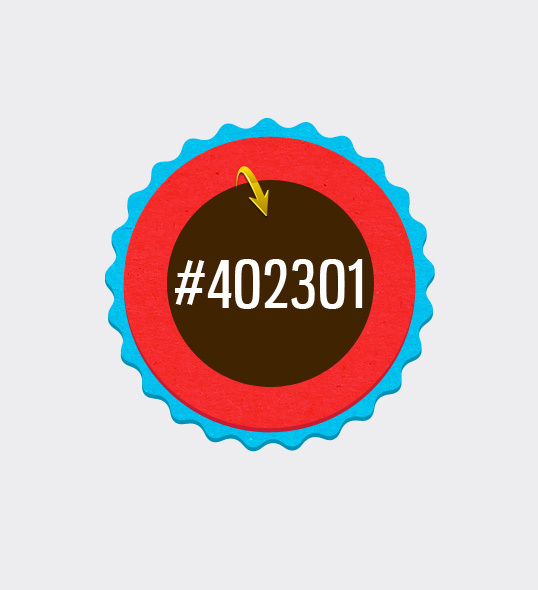 There are many resources for generic badges on the web these days; however, it’s always good to make your own. 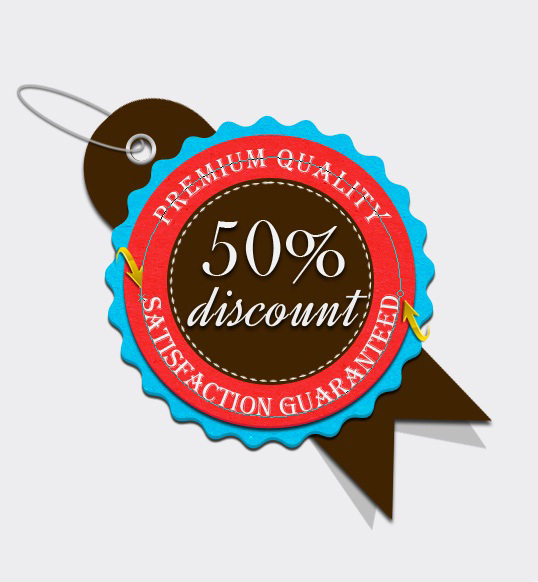 This way, you can tailor it to perfectly suit the needs of your current project. 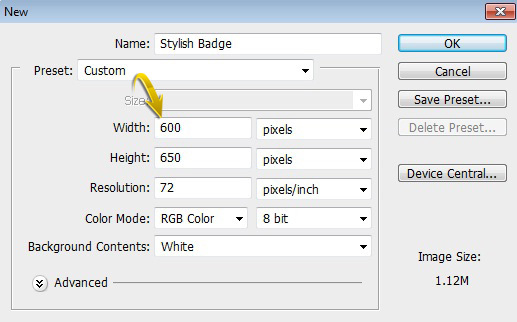 So, today I’ll show you how to make a stylish badge in Adobe Photoshop through an easy step-by-step approach. Create a new document with a 600px width and a 650px height in Adobe Photoshop. Fill the background with #ededef color using the Paint Bucket Tool. 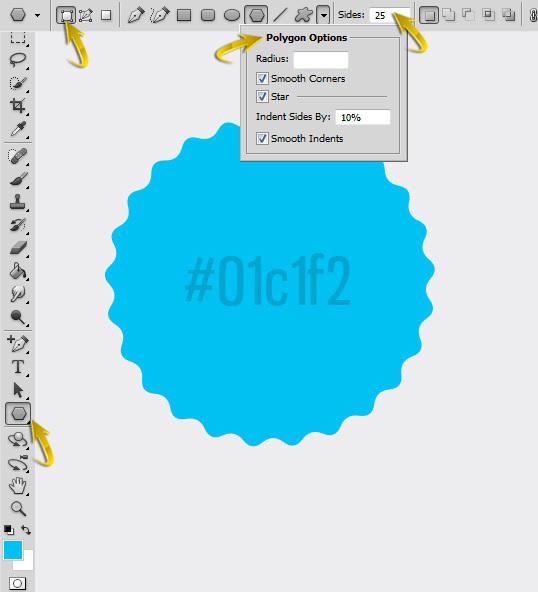 Now, set #01c1f2 as your foreground color, select the Polygon Tool, and use the settings shown below to draw a basic badge shape. Now, duplicate the shape layer by going to “Layer” > “Duplicate layer.” Place the copy of your shape layer below the original shape, drag it a bit downward, and change its color. This will add a sense of “thickness” to your badge. 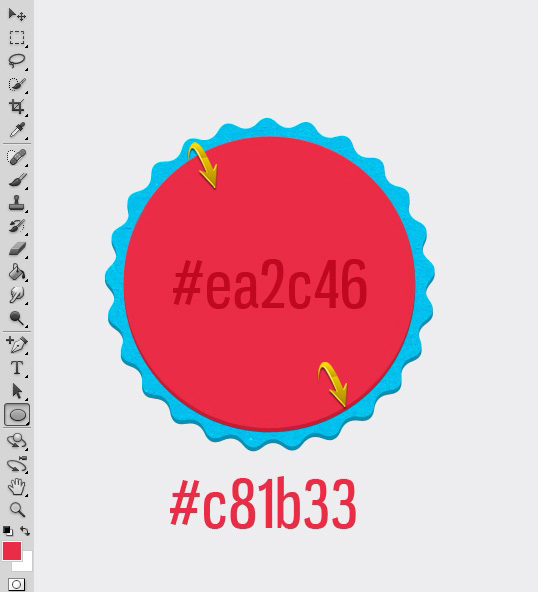 Next, use the Ellipse Tool to draw a circle using #ea2c46 color. Then, duplicate this layer, color it using #c81b33 , place it below the original circle layer, and drag it a bit downward. Apply the cardboard texture on the front circle in the same way that we did in step 4. Draw another smaller circle using Ellipse Tool, as shown below. Now, I’ll make a stitched circle. 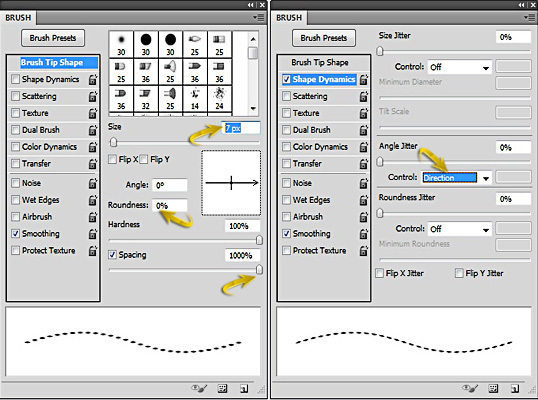 Select the Brush Tool, open the brush panel, and select the settings provided below. 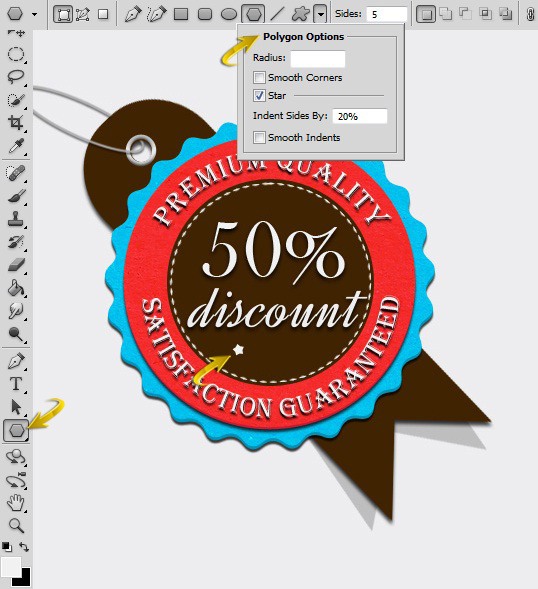 Now select the Ellipse Tool, click on the icon of “paths” from top options bar, and draw a circle on a new layer. Then, right-click and choose the option of “stroke path.” Select “brush” in the stroke path window. 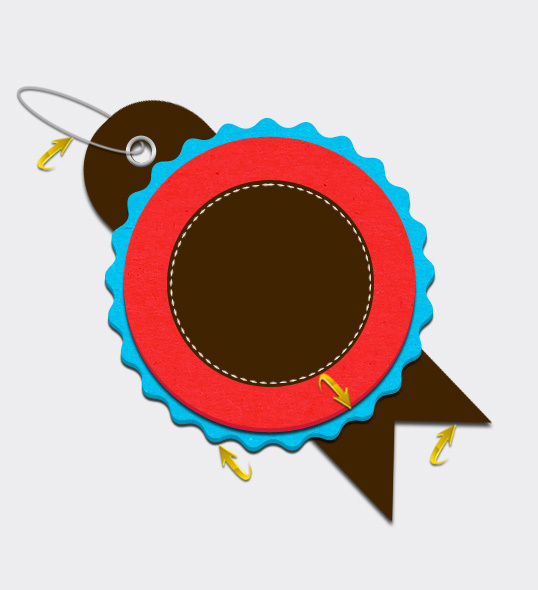 After that, hit Delete to get rid of circular frame. Next, we’ll create a ribbon behind the badge. Create a new layer; place it just above the background. 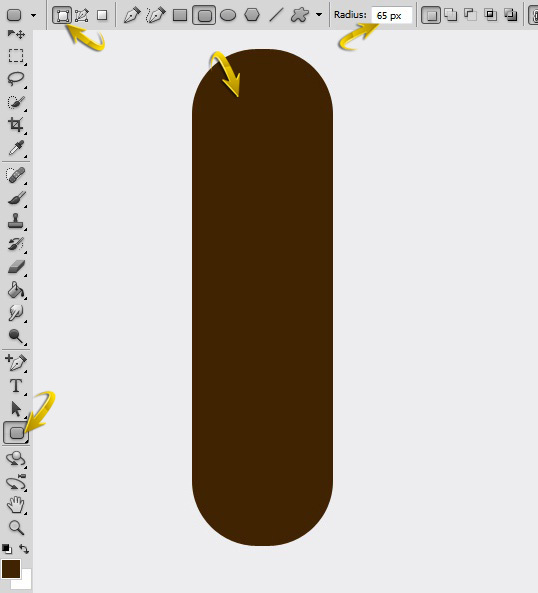 Now select the Rounded Rectangle Tool to draw the shape shown below. Then right-click and select the “Rasterize layer” option. Now, select the Rectangle Tool to draw a square, and rotate it using Free Transform Tool (Ctrl + “T”). Rasterize this layer also. Now press Ctrl + <thumbnail of your square layer> to make selection around the square. Now, click on the rounded rectangle layer and go to “Edit” > “Clear.” This way, you’ll get a nice ribbon as shown below. Now, to make a silver ring around this new hole, make a circle bigger than the first hole on a new layer using the Elliptical Marquee Tool. Fill it with any color for now. 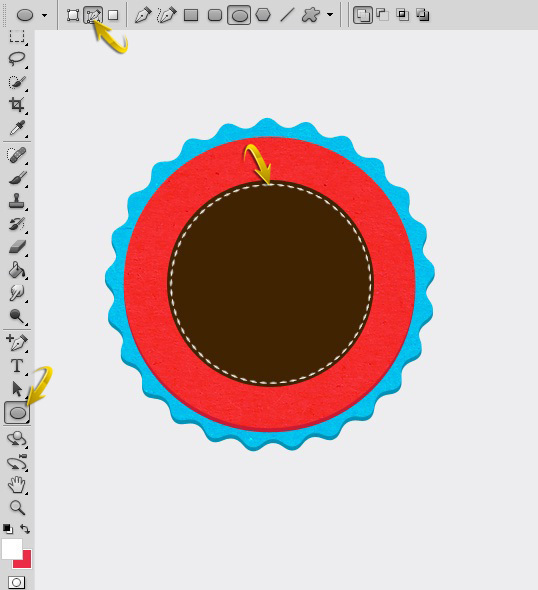 Make another circle that’s approximately the same size of the original hole on a new layer. 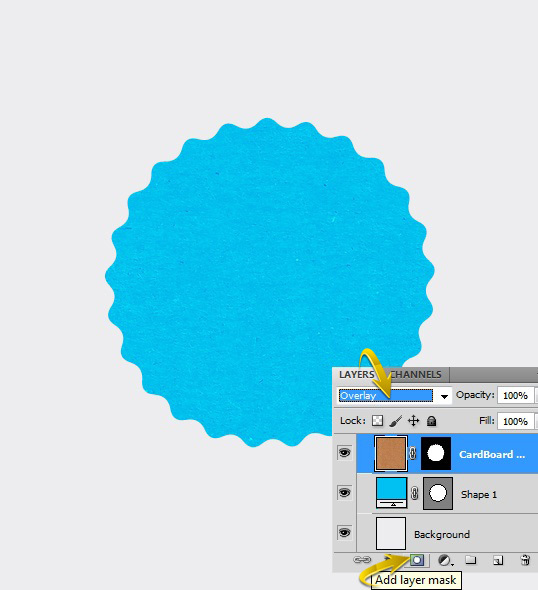 Now press Ctrl + <thumbnail of your hole-sized circle layer> to make selection around it. Then, click on the larger circle layer and select “Edit” > “Clear.” Now, double-click on this ring layer and apply the following settings for a gradient overlay. To form the hanging loop, select the Hard Round Brush with a 3px size. Then, select the Ellipse Tool with the “Paths” option selected, and draw an ellipse. After that, right-click and select “Stroke path” > “Brush.” Now, erase the part that should be behind the ribbon, as shown below. Now, double-click on the ribbon layer to open the layer style window. Use the following settings for a drop shadow. After that, right-click on the ribbon layer and select the option of “copy layer style.” Then, right-click on shape1 copy, shape2 copy, and loop layers, and select the option of “paste layer style” to apply the same drop shadow effect to all of these layers. 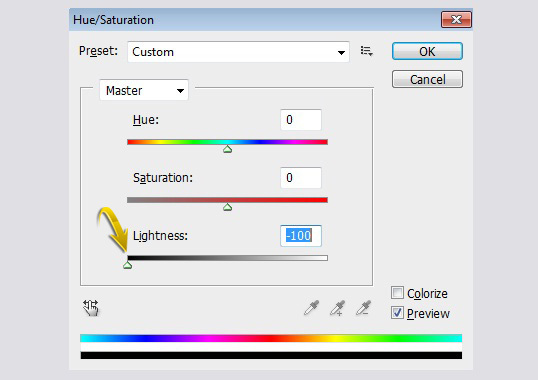 Duplicate the ribbon layer and press Ctrl + “U” to open the “Hue/Saturation” window. 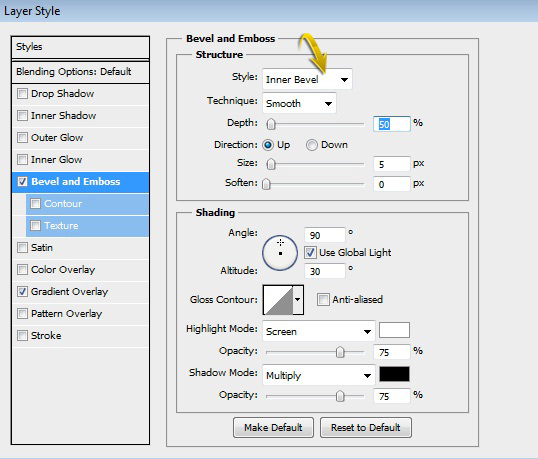 Use the following settings to set the hue and saturation. 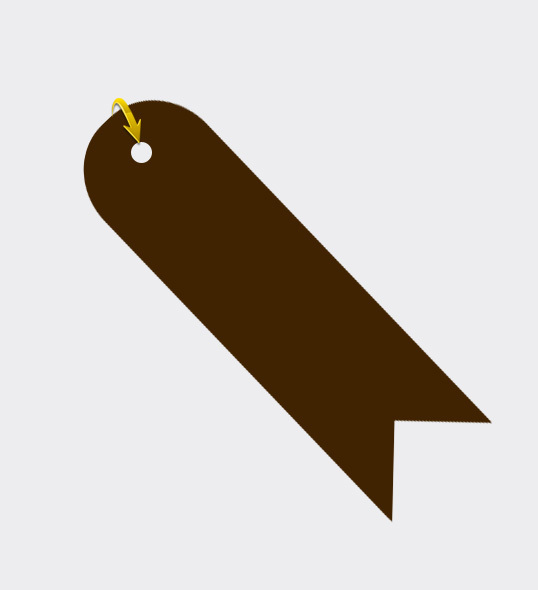 Place this newly-made ribbon layer below the original ribbon layer, rotate it a bit, and reduce its opacity to 20% to give a nice shadow effect. Erase the upper part of this new layer, as shown below. Now, we’ll add some text on this badge. Create a new layer, select the Type Tool, and type in your text. 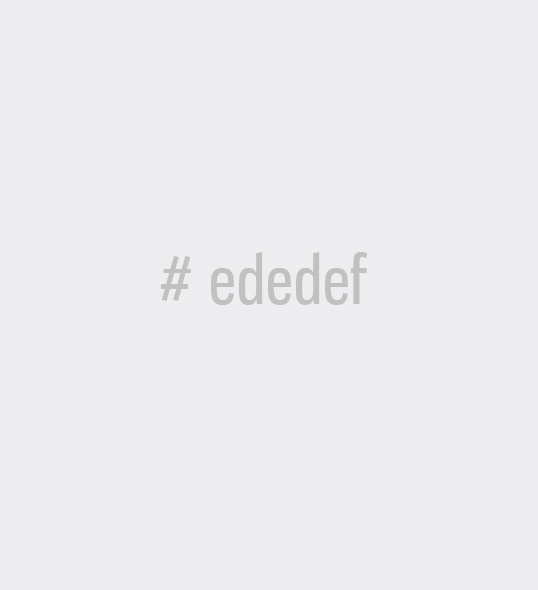 Use color #eeeeee for text. Apply the following settings to create a drop shadow on the text layer(s). Now we will add some text in a circular path. Select the Ellipse Tool. Make sure to click on the icon of “Paths” from top options bar, and draw a circle on a new layer. Now select the Type Tool and take the cursor to your newly-drawn circle; you will notice a change in the cursor the moment it touches that circle. Type in your text, now: it should follow the circular path, as shown below. You will notice two shapes on either side of your circular text. On the left side, there is an “X” sign, which indicates a point from where the text would start. On the right side of the text, there is an “O” sign, which indicates will end. So, by adjusting these two points, you can position your text accordingly. Use the Path Selection Tool to move these two points as needed. 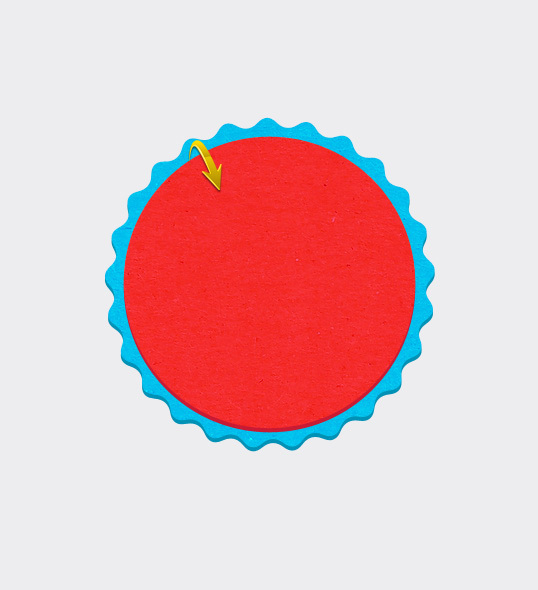 Now, to add text to the lower half of the circle, draw another circle and type in your text. Now select the Path Selection Tool, and take it to the text. It should show an arrow pointing inside of the circle; just drag the text inside the circle. After that, adjust the starting and ending points of the text to position it centrally, much like in step 17. Apply the same drop shadow settings that were used in step 16 to these new circular text layers. Create a new layer; select the Polygon Tool with the following settings to draw a star. Duplicate this star layer few times, and arrange the stars as shown below. Select the Line Tool to draw a small horizontal line, duplicate it and place the lines as shown below. 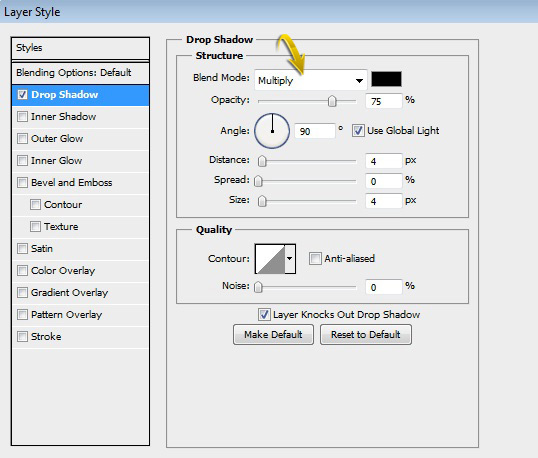 Click on one of the star layers and apply the following drop shadow settings. 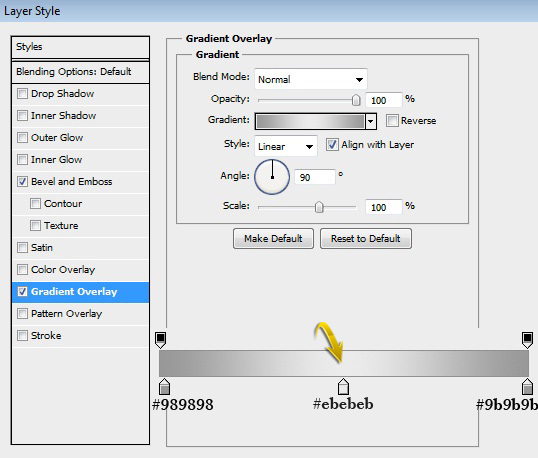 Copy and paste this layer style settings onto all of the remaining star layers and horizontal line layers. Duplicate the hanging loop layer, turn the new copy black, position it at an angle, and reduce this layer’s opacity to 20% to form a nice shadow, much like the one from step 14. 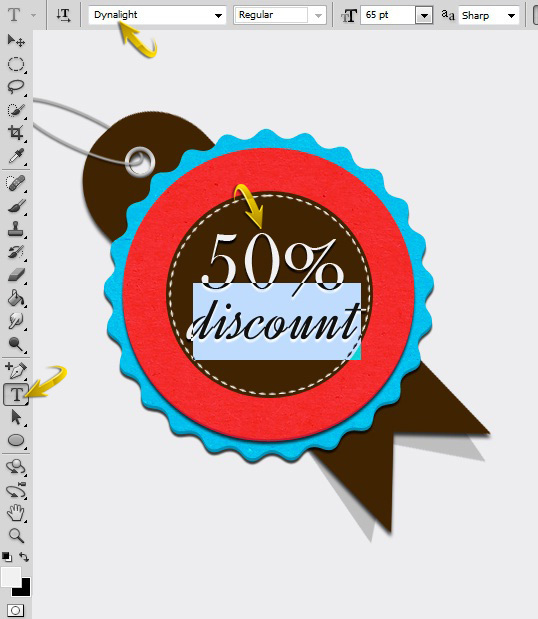 Duplicate the shape2 copy layer and place the new copy below the badge layers. 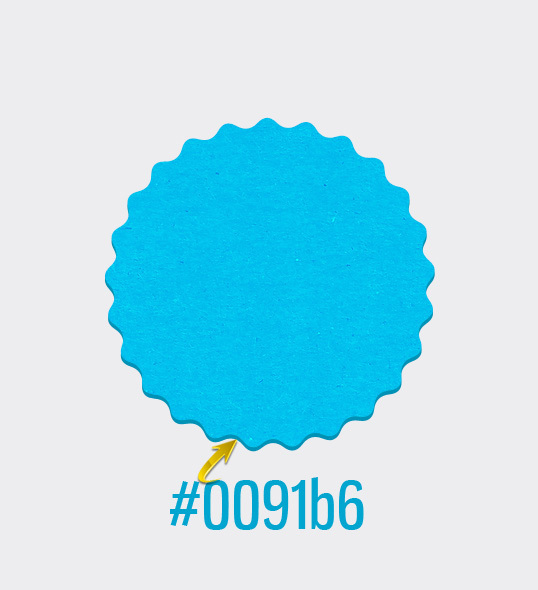 Change the color to #000000 and reduce its opacity to 15%. 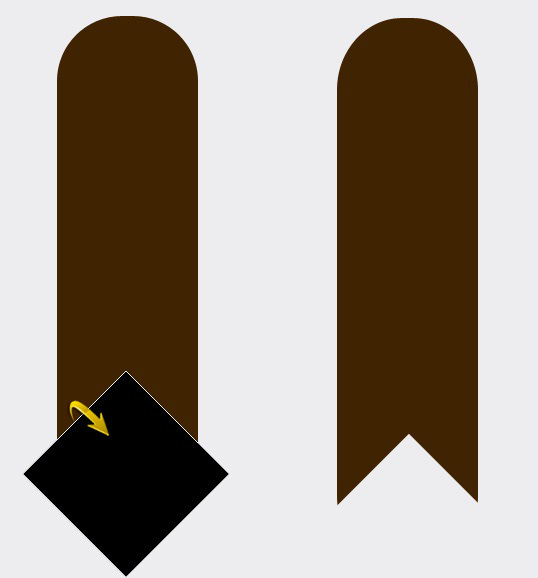 Drag it downward and outward to form a shadow of the badge, as shown below. That’s it! I hope you enjoyed the tutorial and learned something useful. I’ll be waiting for your feedback. Have fun!